Organizing a group trip can be exciting, but talking about the price associated with the occasion isn’t always fun. This is why GOGO Charters aims to make the quoting process as simple as possible. While you’re putting together your trip plans, you won’t have to worry about calling back and forth with a representative to get a charter bus quote for your trip. GOGO Charters will provide you with a personalized quote in a timely fashion. There are a few pieces of information we’ll need before providing your personalized charter bus quote. We’ve outlined a few points to help you prepare for the quoting process. Complete our online rental quote form or give us a call at 1-855-826-6770 whenever you’re ready to find a charter bus for your trip and receive a quote. Our team is available around the clock! Two of the many important factors in the quoting process includes your desired destination and the duration of time you’ll be spending there. Traveling locally will generally be more affordable than an out-of-state trip, while adding multiple cities to your journey may also yield a higher quote. Reserve lodging, any venue spaces, admission tickets, or any other necessary location accommodations before requesting your quote. Knowing how many people will be on your trip will help us determine which type of bus would be best for your group. We’ll know whether your group would be best suited with one of the various models of minibus or a spacious full-sized charter bus. If you’ll be on a strict schedule during your trip or if you’ll be visiting multiple destinations, it’s important that we know your desired arrival and departure times for each step of your trip. This way, we can ensure your charter bus driver is notified accordingly. Every group has a different travel style, requiring different charter bus amenities or accommodations. If your group requires an ADA-compliant bus, we’ll be happy to find a vehicle that meets your needs. Once you have all your trip information locked down, fill out our handy online form and hit “request quote.” Alternatively, you may also call us at 1-855-826-6770 with your trip information to receive a quote. If we need any additional details about your trip before we can provide a quote, we’ll follow up by email or phone call. After you receive your quote via email, you can contact us with any necessary adjustments before confirming the trip and following a secure checkout link. At the time of your trip confirmation, you’ll be asked to put down 10% of your trip’s total cost to reserve your charter bus. Keep in mind, your trip balance must be paid in full at least 30 days before your departure date. Your quote will include the cost of your bus rental and drivers fees but does not include fees like parking, tolls, and tipping your driver (which is not required but is highly appreciated). Once your bus is reserved, all you have to do now is wait for your trip! Do you need to make changes to your trip in the meantime? Feel free to contact your reservation specialist to request updates to your itinerary before the departure date. 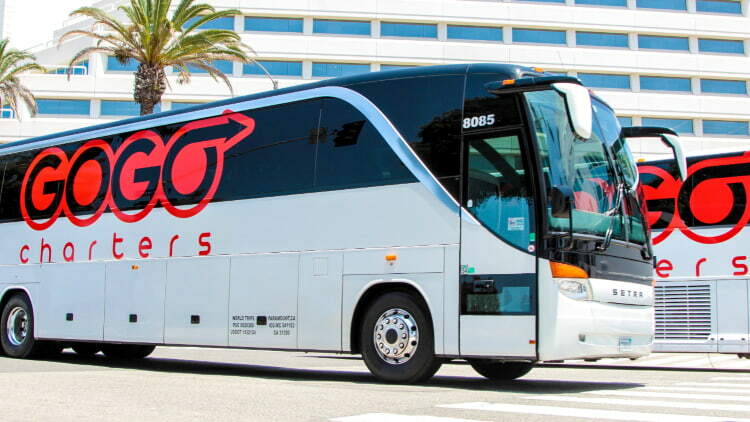 Changes or upgrades to your bus reservation and itinerary may result in additional charges. We’ll finalize your trip details a few days before departure, to ensure your group has everything you’ll need. When the departure date rolls around and it’s time for your trip to start, your driver will arrive on time and keep your trip on track. You’ll also have a reservation specialist available around the clock to provide any necessary support throughout your trip.